Selena Mead is an agent with Section Q. She was born Selena Brennan, raised in the lap of luxury as the daughter of two parents who were each extremely wealthy. Her father, an ambassador, traveled extensively around the world and Selena saw most there was to see as she grew up and learned to feel comfortable in many unusual places. She attended the best schools and went to the best parties. She certainly didn't suffer from want as she grew up and she knew she would always have plenty of security. It was excitement that she had precious little of and no prospects of any. She elected to take a cruise to Europe and then a series of visits to the places she knew growing up, a chance to meet old friends and reuse the many languages she had learned like French, Spanish, Italian, German, and even a dialect of Arabic spoken in North Africa. It was on the last leg of this trip, a stop in Berlin, that changed her life forever. The events in the first book detail her foray into the world of espionage and how she came to become involved with the highly secret Intelligence bureau known only as Section Q, run by the personable Hugh Pierce. It also explains how she meets Simon Mead, an agent with Q, falls in loves with him, marries him, and settle down for a life together. It does so rather quickly, allowing eight years of marriage to pass in just a paragraph as the story moves to the death of her husband and her entry into the spy world herself to catch the killers. Selena is highly intelligent and resourceful. 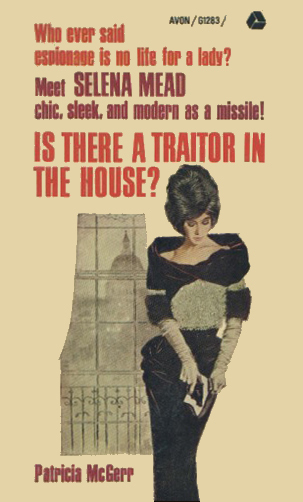 She is also a wonderful example of the transition of the role of women in espionage. She does not shirk from danger or the threat of death and she is even willing, if it is absolutely necessary, to bed her quarry but she is abhorred that her reputation with the neighbors might be compromised. It is interesting that if written five years earlier, she probably would never have thought of doing such things while five years later, she likely wouldn't care what the neighbors thought. Note: Two other stories which were not included in any book were Hide-and-Seek - Russian Style, published in 1976, and The Writing on the Wall, which came out in 1978. The former was published as one of the stories in an anthology called Cloak and Dagger in 1988. Note: In 1964, one year after the first short story appeared, CBS announced that it had added Selena Mead to its drama schedule for the next year. The acclaimed actress Polly Bergen had agreed to play the espionage agent. The show was to have been a half hour long and would likely have been aired on Saturdays, later changed to Mondays. When, however, Ms. Bergen asked that filming be delayed so she might do a movie first, it was dropped. Selena Mead, while in Europe, falls in love with and marries an up-and-coming reporter. When she learns that her husband had been killed, she also learns that he had for many years been a top operative of Section Q. Now she decides to find and bring to justice her husband's killer, becoming an agent herself. All evidence points to the young and upcoming Congressman as the source of secret leaks that are starting to greatly harm the security of the nation. 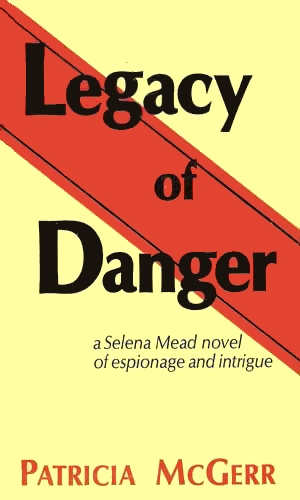 Selena Mead is told to investigate him and his connection with the apparent suicide of a lovely young secretary who seemed to be the treasonous conduit. The two chronicled adventures of Selena Mead are easy to handle and were moderately fun to read. The character is interesting and certainly intrepid but the plots are a big weak and predictable. That being said, I liked the fact that Mead is not a shrinking violet nor is she a femme fatale. She moves quickly from being a pampered rich girl with her life planned out for her to an independent, strong-minded woman who can take care of herself and does not need a man to protect her. Having more books in the series like the second one would have been very welcome. I read, however, that Ms. McGerr had tired of the incredibly beautiful, wealthy, and popular agent and wanted to write about someone else. I also read that in her obituary she always considered Mead would marry her neighbor and Q controller, Hugh, shortly after the second book [unconfirmed].